I am usually quite excited when I get our weekly email about what’s coming in the CSA, but when I saw this week’s one, I said “OH. YES.” out loud. Why? RAMPS. Anyway, the salsa will go in our stockpile, but since we cook Mexican food regularly, this won’t be a problem to use up before it comes time to make fresh salsa. Potatoes will be a side of some sort, and the lettuce like usual will end up in salads. Sometimes the best preparations for veggies are the simple ones. Eggs will add to our stockpile as well. The ones you see in the bowl behind the CSA eggs are from our own chickens, so we have a combination of both on hand. Will give Mark a chance to experiment with some recipes from Michael Ruhlman’s new cookbook, Egg. This fresh feta cheese from Hidden Hills Dairy looks amazing. I used to be averse to all crumbly cheese because of the texture, but it was one of the items that Mark really introduced me to that has grown on me to the point that I love it now. We have spinach in our garden right now that overwintered in a miracle, so I’m thinking it might make a good combination with the feta in some dish – maybe even with this fresh rigatoni from Fontana Pasta. We have loved this fresh pasta – and would probably order way more of it if we had more freezer space. And now for the main event – what I’ve been waiting to cook with my whole life. Ramps. Ramps are wild leeks that have a garlic flavor to them. I’ve had them at restaurants before – most recently at Cure as a “ramp ash” on pasta. But I’ve never been able to cook with them myself, primarily because the farmers markets aren’t open when these babies show up, and also because I have no idea how to forage for them. I might not forage for them anyway, since there are concerns about over-foraging since these have exploded in popularity. 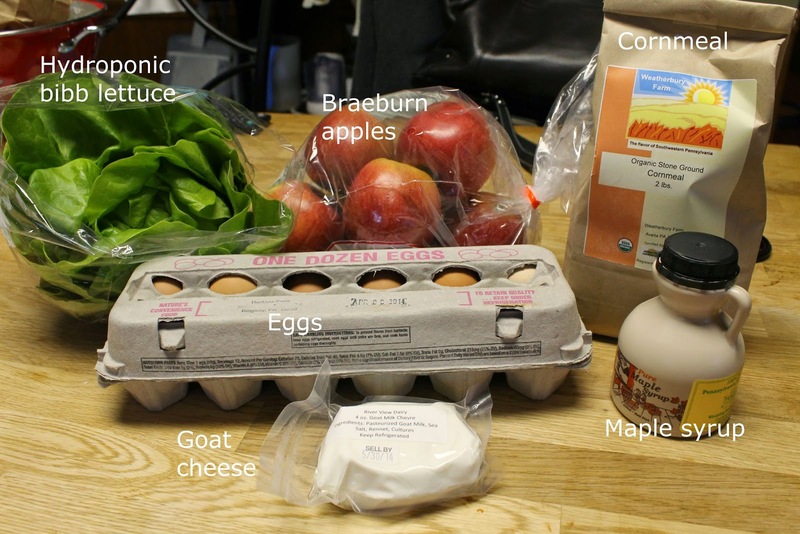 But as they state in the weekly blog post, Penn’s Corner’s suppliers and member farms are committed to sustainable practices. So I’m beyond excited to get a chance to make something with these. What that will be remains to be seen, but there are tons of recipes out there for them, being the hot commodity that they are. As a side note, we also ordered from the Penn’s Corner Farm Stand this week to refresh our supply of Clarion River Organics bread and butter jalapenos, which I’m so obsessed with, I have started putting them on everything. I might have to use a similar preparation and canning if our jalapenos do well this year, but for the moment, we are enjoying the luxury of someone else’s hard canning work. 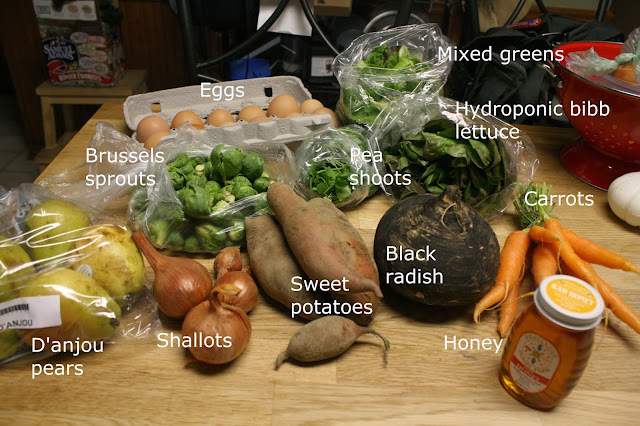 I almost feel like the titles of my posts are misnomers, since we get so much more than produce in our CSA shares from Penn’s Corner. And that’s definitely the case this week! Henceforth it will just be the week number, and I’ll use labels to help classify what’s in them. The lettuce will go in salads, like usual. These apples made great snacks the last time we had them, so they will likely serve as snacks again this week. Eggs will supplement the ones we get from our three ladies in the backyard. And the maple syrup will be an addition to our ever growing supply. (We have a syrup hookup from the north – my grandpa.) We’re going to have to start eating more pancakes! Though really I need to start looking for more ways to incorporate maple syrup into non-breakfast foods, like baked goods. Probably the winner this week for “thing Joanna is most excited about” is the cornmeal from Weatherbury. We’ve been getting beef from Weatherbury for years, and Mark hunts red tag on their farm. (Red tag is a special season for deer hunting in PA to help farmers who suffer crop damage from deer.) We know their farm and how dedicated they are to it and have been waiting and waiting for them to go through the onerous paperwork process to be able to sell their prize-winning grains to consumers. We ordered from them directly when they were first able to sell it, but I’m really glad their items are available through Penn’s Corner, too. Looks like we’re going to be eating some cornbread this week. If not as a side, maybe as the topping on a skillet pie of some kind? We shall see! Don’t forget to follow along on Instagram as I use some CSA items throughout the week under the hashtag #reallifeCSA! 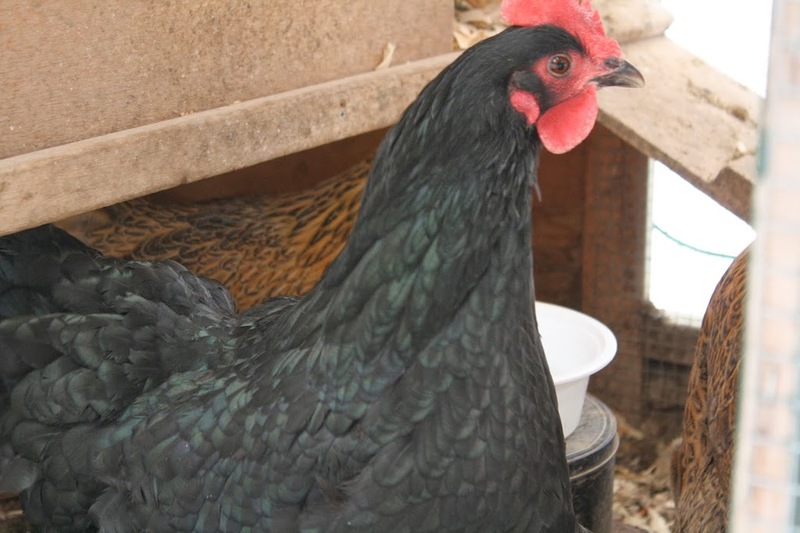 I hauled my bags in the house and came back out to find Ensign Rickey, one of our Black Australorps, dropped in one of our raised beds, her neck broken and feathers everywhere. (Ensign Rickey’s name is a Star Trek reference – our affectionate name for a generic redshirt.) Ensign Rickey was our best layer – a champion, even through this brutal winter. We even joked that we should let her retire in style since she was so dependable and was largely responsible for us even having any eggnog at Christmas at all. She was always the first to pump her legs across our yard when we’d walk onto the porch and yell TREAT! Even though we don’t really look at the chickens as pets like we do our cats who live with us inside, the chickens are part of our family and we protect their lives and care for them like we do our pets. They are valuable to us and we make their lives as carefree and chicken-y as possible. But the side effect of a free life outside of a cage is that sometimes predators show up. We’d actually never seen a hawk in Carnegie before, until Mark opened the back gate to find one sitting on the chicken coop, with Ensign Rickey on the ground and the others terrified and squacking behind our compost piles. If we lived in the country and could really have the chickens free range outside of a fenced in yard, we’d lose some to other ground predators. I know this. Animals die just like humans do, and thankfully we don’t think Ensign Rickey suffered too much. Mark walked into the yard and startled the hawk before it could go after one of the other hens. It was dusk by the time I got home in the first place, so we got out the boots and shovels and dug into the frozen ground as it was getting dark, to make a place for her. We even said the gralloch prayer over the spot, a prayer of thanks for life that gives sustenance to others, as Ensign Rickey gave us eggs faithfully for the almost 3 years that we had her. It was a sad evening. When I first laid eyes on her body, I cried. My first thought was that I hope she didn’t suffer. But it made me think that even if she did, the rest of her life was carefree and full of delicious scratch treats, digging for bugs in soft earth, chattering with her flock and pooping wherever she darn well pleased, with a warm and comfortable roost for cold evenings. Allow me to step on a soapbox here. What about all the other chickens that we use for eggs in this country, housed in horrid conditions, smashed into cages with broken legs and clipped beaks, unable to move, wallowing in their own waste, sick and dying? Just so we can have cheap eggs? No one cries for those birds when they die, and most people prefer it that way – because to turn your face away from the suffering of those animals allows you to buy eggs for $1/dozen and not worry about it. And that’s what it is – suffering. If you don’t believe me, watch this. Consider finding a farmer near you that sells eggs – many farm stands and farmers markets sell them. Or consider your own backyard chickens. But think the next time you buy eggs about what we as a society are giving those birds for the gift of their eggs, a staple of many diets. Torturing another species in order to take something from them, giving nothing in return – not even compassion – isn’t right. Think about where you are sourcing your animal products. Not all eggs are the same. Ensign Rickey’s sure weren’t. 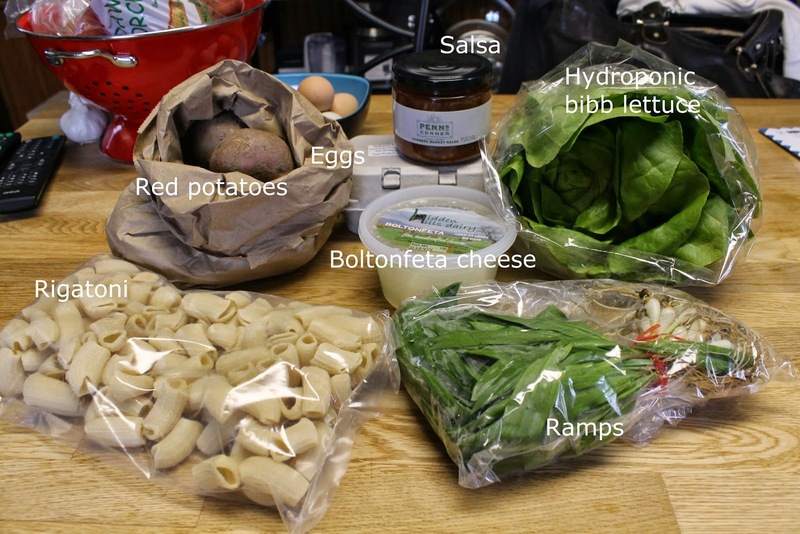 More variety in this share – and more pasta! As a big pasta lover, this lemon pepper rotini will make a great dinner – possibly with some sauce that involves goat cheese. Although the goat cheese would also go really well with this hot pepper jelly (which I accidentally labeled jam up in the top photo). I didn’t realized I liked hot pepper jelly until a friend brought her dad’s homemade jelly to a party with brie and puff pastry and it was delightful. So many uses for this stuff! We’ve been enjoying fresh lettuce with each of these shares. If we get this again, I’ll take a photo of the whole bunch, so you can see how they cut the lettuce when it’s grown hydroponically. Onions and potatoes will be pantry staples and the same goes for the dilly beans. Apple cider we’ll drink up – we like to mix it with club soda for fizzy apple cider with a little bit less sweetness. 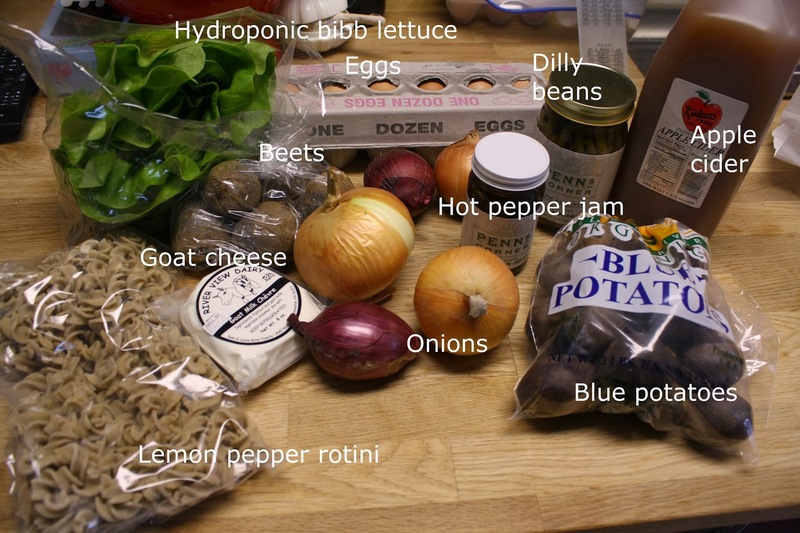 As for the beets, I might try to be ambitious and find another recipe to test that I might actually like. If not, we’ll give them to someone who likes them or compost them! So here’s what we got for the first share! We get an email with details before each share, but Penn’s Corner also posts even more information on their blog. It includes recipes and a list of where each item came from, since they aren’t all from the same farm. I am psyched to see honey from Bedillion Honey Farm, which is an essential ingredient in the homemade granola I make for breakfasts. I absolutely adore brussels sprouts, so these ones from Clarion River Organics will be roasted with the shallots we got in this share from Crighton’s Farm. It comes in really handy for us that we also got a dozen eggs, since our chickens have been going through a decently long period of not laying, with the time change and lack of light, plus molting at the same time. Only within the last week did one of them (Ensign Ricky the champ, we think) start laying again, so our egg supply has dwindled significantly. These eggs are from Heritage Farm. All of the great greens will be eaten up in salad, including the hydroponic bib lettuce. The pears will make great snacks too! Definitely thrilled with the selection and quality of this first share – and can’t wait until we get to discover the next one in two weeks!